Captivate the complete attention of young ones with this spectacular array of activity-based worksheets on number names up to 10! This forms an excellent teaching resource for both parents and teachers alike. Kids are sure to enjoy this series of fun-filled and interactive worksheets that include a plethora of tasks like cut-and-glue activities, writing numbers and numbers names, match the number names to the numbers and a lot more! Keep young one's thoroughly engaged with this series of vivid theme-based worksheets that includes circus animals, flowers, and umbrellas. Read out the numbers. 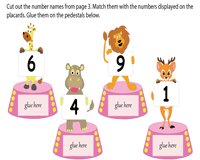 Help children cut out the correct number names to match the numbers; and get them to glue the number names onto the worksheets. Children are sure to grasp the concept of matching numbers with number names with this colorful collection of worksheets that feature hot air-balloons, fish bowls and cute little penguins! 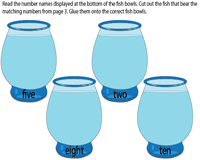 Read the number names, cut out the numbers that match them and glue them in the spaces provided in the worksheets. 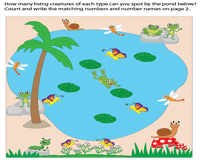 Little ones are bound to love these attractive worksheets that display animals in the wild, sea creatures, and animal life by the pond! How many creatures of each type can you spot? Write the correct numbers and number names in the columns provided. 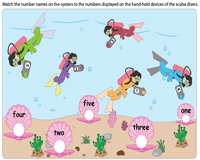 Employ this array of appealing worksheets that comprise eye-catching themes like snowmen, scuba divers, and airplanes to get young ones to match the number names with the equivalent numbers. Download all for a delightful experience!